This is the sandbox page for User:TVMiniuni (diff). 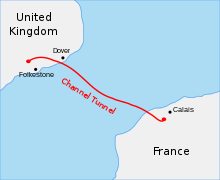 The Channel Tunnel (French: Le tunnel sous la Manche; also nicknamed and shortened to Chunnel) is a 50.5-kilometre (31.4 mi) rail tunnel linking Folkestone, Kent, in the United Kingdom, with Coquelles, Pas-de-Calais, near Calais in northern France, beneath the English Channel at the Strait of Dover. At its lowest point, it is 75 m (250 ft) deep. At 37.9 kilometres (23.5 mi), the tunnel has the longest undersea portion of any tunnel in the world, although the Seikan Tunnel in Japan is both longer overall at 53.85 kilometres (33.46 mi) and deeper at 240 metres (790 ft) below sea level. The speed limit in the tunnel is 160 kilometres per hour (99 mph). * 1802: Albert Mathieu put forward a cross-Channel tunnel proposal. In 1865, a deputation led by George Ward Hunt proposed the idea of a tunnel to the Chancellor of the Exchequer of the day, William Ewart Gladstone. In 1919, during the Paris Peace Conference, the British prime minister, David Lloyd George, repeatedly brought up the idea of a Channel tunnel as a way of reassuring France about British willingness to defend against another German attack. The French did not take the idea seriously and nothing came of Lloyd George's proposal. In 1955, defence arguments were accepted to be irrelevant because of the dominance of air power, and both the British and French governments supported technical and geological surveys. In 1958 the 1881 workings were cleared in preparation for a £100,000 geological survey by the Channel Tunnel Study Group. 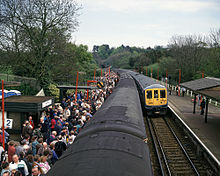 30% of the funding came from the Channel Tunnel Co Ltd, the largest shareholder of which was the British Transport Commission, as successor to the South Eastern Railway. A detailed geological survey was carried out in 1964–65. Although the two countries agreed to build a tunnel in 1964, the phase 1 initial studies and signing of a second agreement to cover phase 2 took until 1973. Construction work of this government-funded project to create two tunnels designed to accommodate car shuttle wagons on either side of a service tunnel started on both sides of the Channel in 1974. On 20 January 1975, to the dismay of their French partners, the now governing Labour Party in Britain cancelled the project due to uncertainty about EEC membership, doubling cost estimates and the general economic crisis at the time. By this time the British tunnel boring machine was ready and the Ministry of Transport was able to do a 300 m (980 ft) experimental drive. This short tunnel was reused as the starting and access point for tunnelling operations from the British side. The cancellation costs were estimated to be £17 million. The cross-Channel ferry industry protested under the name "Flexilink". In 1975 there was no campaign protesting against a fixed link, with one of the largest ferry operators (Sealink) being state-owned. Flexilink continued rousing opposition throughout 1986 and 1987. Public opinion strongly favoured a drive-through tunnel, but ventilation issues, concerns about accident management, and fear of driver mesmerisation led to the only shortlisted rail submission, CTG/F-M, being awarded the project in January 1986. Among reasons given for the selection was that it caused least disruption to shipping in the Channel, least environmental disruption, was the best protected against terrorism, and was the most likely to attract sufficient private finance. The design and construction was done by the ten construction companies in the CTG/F-M group. The French terminal and boring from Sangatte was undertaken by the five French construction companies in the joint venture group GIE Transmanche Construction. The English Terminal and boring from Shakespeare Cliff was undertaken by the five British construction companies in the Translink Joint Venture. The two partnerships were linked by TransManche Link (TML), a bi-national project organisation. The Maître d'Oeuvre was a supervisory engineering body employed by Eurotunnel under the terms of the concession that monitored project activity and reported back to the governments and banks. The tunnel is a build-own-operate-transfer (BOOT) project with a concession. TML would design and build the tunnel, but financing was through a separate legal entity, Eurotunnel. Eurotunnel absorbed CTG/F-M and signed a construction contract with TML, but the British and French governments controlled final engineering and safety decisions, now in the hands of the Channel Tunnel Safety Authority. The British and French governments gave Eurotunnel a 55-year operating concession (from 1987; extended by 10 years to 65 years in 1993) to repay loans and pay dividends. A Railway Usage Agreement was signed between Eurotunnel, British Rail and SNCF guaranteeing future revenue in exchange for the railways obtaining half of the tunnel's capacity. Tunnelling commenced in 1988, and the tunnel began operating in 1994. In 1985 prices, the total construction cost was £4.650 billion (equivalent to £14 billion today), an 80% cost overrun. At the peak of construction 15,000 people were employed with daily expenditure over £3 million. Ten workers, eight of them British, were killed during construction between 1987 and 1993, most in the first few months of boring. Between the portals at Beussingue and Castle Hill the tunnel is 50.5 kilometres (31 mi) long, with 3.3 kilometres (2 mi) under land on the French side and 9.3 kilometres (6 mi) on the UK side, and 37.9 kilometres (24 mi) under sea. It is the third-longest rail tunnel in the world, behind the Gotthard Base Tunnel in Switzerland and the Seikan Tunnel in Japan, but with the longest under-sea section. The average depth is 45 metres (148 ft) below the seabed. On the UK side, of the expected 5 million cubic metres (6.5×10^6 cu yd) of spoil approximately 1 million cubic metres (1.3×10^6 cu yd) was used for fill at the terminal site, and the remainder was deposited at Lower Shakespeare Cliff behind a seawall, reclaiming 74 acres (30 ha) of land. 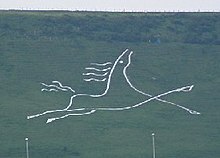 This land was then made into the Samphire Hoe Country Park. Environmental impact assessment did not identify any major risks for the project, and further studies into safety, noise, and air pollution were overall positive. However, environmental objections were raised over a high-speed link to London. The surveying in 1958–59 catered for immersed tube and bridge designs as well as a bored tunnel, and thus a wide area was investigated. At this time, marine geophysics surveying for engineering projects was in its infancy, with poor positioning and resolution from seismic profiling. The 1964–65 surveys concentrated on a northerly route that left the English coast at Dover harbour; using 70 boreholes, an area of deeply weathered rock with high permeability was located just south of Dover harbour. Given the previous survey results and access constraints, a more southerly route was investigated in the 1972–73 survey, and the route was confirmed to be feasible. Information for the tunnelling project also came from work before the 1975 cancellation. On the French side at Sangatte, a deep shaft with adits was made. On the English side at Shakespeare Cliff, the government allowed 250 metres (820 ft) of 4.5-metre (15 ft) diameter tunnel to be driven. The actual tunnel alignment, method of excavation and support were essentially the same as the 1975 attempt. In the 1986–87 survey, previous findings were reinforced, and the characteristics of the gault clay and the tunnelling medium (chalk marl that made up 85% of the route) were investigated. Geophysical techniques from the oil industry were employed. Power is delivered to the locomotives via an overhead line (catenary) at 25 kV 50 Hz. All tunnel services run on electricity, shared equally from English and French sources. There are two sub-stations fed at 400 kV at each terminal, but in an emergency the tunnel's lighting (about 20,000 light fittings) and plant can be powered solely from either England or France. Signalling in the tunnel is coordinated from two control centres: The main control centre at the Folkestone terminal, and a backup at the Calais terminal, which is staffed at all times and can take over all operations in the event of a breakdown or emergency. Conventional ballasted tunnel-track was ruled out owing to the difficulty of maintenance and lack of stability and precision. The Sonneville International Corporation's track system was chosen based on reliability and cost-effectiveness based on good performance in Swiss tunnels and worldwide. The type of track used is known as Low Vibration Track (LVT). Like ballasted track the LVT is of the free floating type, held in place by gravity and friction. Reinforced concrete blocks of 100 kg support the rails every 60 cm and are held by 12 mm thick closed cell polymer foam pads placed at the bottom of rubber boots. The latter separate the blocks' mass movements from the lean encasement concrete. Ballastless track provides extra overhead clearance necessary for the passage of larger trains. The corrugated rubber walls of the boots add a degree of isolation of horizontal wheel-rail vibrations, and are insulators of the track signal circuit in the humid tunnel environment. UIC60 (60 kg/m) rails of 900A grade rest on 6 mm (0.2 in) rail pads, which fit the RN/Sonneville bolted dual leaf-springs. The rails, LVT-blocks and their boots with pads were assembled outside the tunnel, in a fully automated process developed by the LVT inventor, Mr. Roger Sonneville. About 334,000 Sonneville blocks were made on the Sangatte site. Maintenance activities are less than projected. Initially the rails were ground on a yearly basis or after approximately 100MGT of traffic. Ride quality continues to be noticeably smooth and of low noise. Maintenance is facilitated by the existence of two tunnel junctions or crossover facilities, allowing for two-way operation in each of the six tunnel segments thereby created, and thus providing safe access for maintenance of one isolated tunnel segment at a time. The two crossovers are the largest artificial undersea caverns ever built; 150 m long, 10 m high and 18 m wide. The English crossover is 8 km (5 mi) from Shakespeare Cliff, and the French crossover is 12 km (7 mi) from Sangatte. The ventilation system maintains the air pressure in the service tunnel higher than in the rail tunnels, so that in the event of a fire, smoke does not enter the service tunnel from the rail tunnels. Two cooling water pipes in each rail tunnel circulate chilled water to remove heat generated by the rail traffic. Pumping stations remove water in the tunnels from rain, seepage, and so on. Both the freight and passenger traffic forecasts that led to the construction of the tunnel were overestimated; in particular, Eurotunnel's commissioned forecasts were over-predictions. Although the captured share of Channel crossings was forecast correctly, high competition (especially from budget airlines which expanded rapidly in the 1990s and 2000s) and reduced tariffs led to low revenue. Overall cross-Channel traffic was overestimated. Cross-tunnel passenger traffic volumes peaked at 18.4 million in 1998, dropped to 14.9 million in 2003, then rose to 21.0 million in 2014. There is a need for full passport controls, since this is the border between the Schengen Area and the Common Travel Area. There are juxtaposed controls, meaning that passports are checked before boarding first by officials belonging to departing country and then officials of the destination country. These are only placed at the main Eurostar stations - (London, Ebbsfleet, Ashford, Calais, Lille, Brussels and Paris). There are security checks before boarding as well. For the shuttle road-vehicle trains, there are juxtaposed passport controls before boarding the trains. For Eurostar trains travelling from places south of Paris, there is no passport and security check before departure, and those trains must stop in Lille at least 30 minutes to allow all passengers to be checked. No checks are done on board. There have been plans for services from Amsterdam, Frankfurt and Cologne to London, but a major reason to cancel them was the need for a stop in Lille. The terminals' sites are at Cheriton (near Folkestone in the United Kingdom) and Coquelles (near Calais in France). The terminals are designed to transfer vehicles from the motorway onto trains at a rate of 700 cars and 113 heavy vehicles per hour. The UK site uses the M20 motorway for access. The terminals are organised with the frontier controls juxtaposed with the entry to the system to allow travellers to go onto the motorway at the destination country immediately after leaving the shuttle. The area of the UK site was severely constrained and the design was challenging. The French layout was achieved more easily. To achieve design output, the shuttles accept cars on double-deck wagons; for flexibility, ramps were placed inside the shuttles to provide access to the top decks. 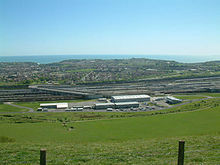 At Folkestone there are 20 kilometres (12 mi) of main-line track, 45 turnouts and eight platforms. At Calais there are 30 kilometres (19 mi) of track and 44 turnouts. At the terminals the shuttle trains traverse a figure eight to reduce uneven wear on the wheels. There is a freight marshalling yard west of Cheriton at Dollands Moor Freight Yard. Illegal Immigrants and would-be asylum seekers have used the tunnel to attempt to enter Britain. By 1997 the problem had attracted international press attention, and the French Red Cross opened a refugee centre at Sangatte in 1999, using a warehouse once used for tunnel construction; by 2002 it housed up to 1,500 people at a time, most of them trying to get to the UK. In 2001, most came from Afghanistan, Iraq and Iran, but African and Eastern European countries were also represented. In January 2014, UK operators EE and Vodafone signed ten-year contracts with Eurotunnel for Running Tunnel North. The agreements will enable both operators' subscribers to use 2G and 3G services. Both EE and Vodafone plan to offer LTE services on the route; EE said it expected to cover the route with LTE connectivity by summer 2014. EE and Vodafone will offer Channel Tunnel network coverage for travellers from the UK to France. Eurotunnel said it also held talks with Three UK but has yet to reach an agreement with the operator. ^ Institution of Civil Engineers (Great Britain) (1995). The Channel Tunnel: Transport systems, Volume 4. 108. Thomas Telford. p. 22. ISBN 9780727720245. ^ Oxford Dictionary of English (2nd ed.). OUP Oxford. 11 August 2005. ISBN 3-411-02144-6. ^ Janet Stobart (20 December 2009). "Rail passengers spend a cold, dark night stranded in Chunnel". L.A. Times. Retrieved 27 June 2010. ^ "The Channel Tunnel". raileurope.com. Retrieved 19 July 2009. ^ "Turkey Building the World's Deepest Immersed Tube Tunnel". Popular Mechanics. Retrieved 19 July 2009. ^ Dumitrache, Alina (24 March 2010). "The Channel Tunnel - Traveling Under the Sea". AutoEvolution. Retrieved 2 August 2014. ^ a b Chisholm, Michael (1995). Britain on the edge of Europe. London: Routledge. p. 151. ISBN 0-415-11921-9. ^ "The Channel Tunnel". library.thinkquest.org. Archived from the original on 12 December 2007. Retrieved 19 July 2009. ^ Paddy at Home ("Chez Paddy") (2nd ed.). Chapman & Hall Covent Garden, London. 1887. ^ "Channel tunnel fire worst in service's history". The Guardian. 12 September 2008. Retrieved 21 February 2014. ^ "Thousands freed from Channel Tunnel after trains fail". BBC News. 19 December 2009. Retrieved 21 February 2014. ^ "Four men caught in Channel Tunnel". BBC News. 4 January 2008. Retrieved 19 July 2009. ^ "Sangatte refugee camp". The Guardian. UK. 23 May 2002. Retrieved 19 July 2009. ^ "Subterranea Britannica: Channel Tunnel – 1880 attempt". subbrit.org. Retrieved 19 July 2009. 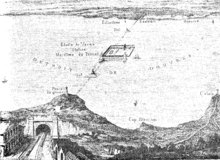 ^ "The Proposed Tunnel Between England and France" (PDF). The New York Times. 7 August 1866. Retrieved 3 January 2008. ^ Gladstone, William (1902). A. W. Hutton & H. J. Cohen (ed.). The Speeches of the Right Hon. W. E. Gladstone on Home Rule, Criminal Law, Welsh And Irish Nationality, National Debt and the Queen's Reign. The Speeches And Public Addresses of the Right Hon. W. E. Gladstone, M.P. X. London: Methuen And Company. Retrieved 13 May 2008. ^ "Things Worth Recording about Steam Navigation". The Mercury (Hobart, Tas. : 1860 – 1954). Hobart, Tas. : National Library of Australia. 9 October 1866. p. 3. Retrieved 26 April 2014. ^ Breuer, William B. (2003). The Spy Who Spent the War in Bed: And Other Bizarre Tales from World War II. Hoboken, New Jersey: Wiley. p. 40. ISBN 0-471-26739-2. ^ "Channel Tunnel Site Investigation – 1964 – Halcrow Group". Halcrow Group. 13 July 2011. Retrieved 26 July 2011. Online presentation of a 1964–65 film documentary of a geological survey of the Channel, with a brief summary. ^ a b "Illustrated London News". 1975. ^ a b Foreign & Commonwealth Office 1994, p. 5. ^ a b "On this day: Tunnel links UK and Europe". BBC News. 1 December 1990. Retrieved 19 July 2009. ^ Harlow, John (2 April 1995). "Phantom Trains Wreak Havoc in Channel Tunnel". The Times. UK. ^ "ingenious: Navvies". ingenious. 11 March 2008. Retrieved 19 July 2009. ^ "Thirteen workers die as safety standards are ignored in race to build Olympic sites". The Independent. UK. 3 April 2004. Retrieved 26 September 2008. ^ Glenn Frankel (31 October 1990). "Britain and France Link Up-at Last". The Washington Post. ^ "Chunnel birthday". Evening Mail. Birmingham Post & Mail Ltd. 2 December 2000. ^ a b "On This Day – 1994: President and Queen open Chunnel". BBC News. 6 May 1994. Retrieved 12 January 2008. ^ Woodman, Peter (14 November 2007). "High-speed Rail Link Finally Completed". Press Association National Newswire. ^ "New high-speed rail line opens to link Britain to Europe". Channel NewsAsia. MediaCorp News. 15 November 2007. ^ "Seven Wonders". American Society of Civil Engineers. Retrieved 7 October 2012. ^ Gilbert, Jane (1 December 2006). "'Chunnel' workers link France and Britain". The Daily Post (New Zealand). APN New Zealand Ltd.
^ Harris, C.S. ; et al., eds. (1996). Engineering Geology of the Channel Tunnel. London: Thomas Telford. p. 57. ISBN 0-7277-2045-7. ^ Pierre-Jean Pompee. "Channel Tunnel: Tunnel's Construction" (PDF). pagesperso-orange.fr. Retrieved 19 July 2009. ^ Foreign & Commonwealth Office 1994, p. 9. ^ Foreign & Commonwealth Office 1994, p. 14. ^ Foreign & Commonwealth Office 1994, p. 8. ^ "Prima II tested in the Channel Tunnel". Railway Gazette International. Retrieved 1 October 2012. ^ a b c d e f g Ricard Anguera (May 2006). "The Channel Tunnel—an ex post economic evaluation". Transportation Research Part A: Policy and Practice. 40 (4): 291–315. doi:10.1016/j.tra.2005.08.009. ^ DVV Media UK. "IGC grants Deutsche Bahn access to Channel Tunnel". Railway Gazette. ^ a b c d e f g h "Traffic figures". Eurotunnel. Retrieved 6 February 2011. ^ a b "Eurotunnel 2008 traffic and revenue figures". Eurotunnel. 15 January 2009. Retrieved 15 January 2009. ^ a b "Eurotunnel 2010 traffic and revenue figures" (PDF). Eurotunnel. 18 January 2011. Retrieved 6 February 2011. ^ a b c d "Traffic figures". Eurotunnel. Retrieved 15 January 2009. ^ a b "Study Report Annex 2". southeast-ra.gov.uk. South East England Regional Assembly. June 2004. pp. Table 11. Retrieved 21 January 2009. ^ "Eurotunnel 2003 Revenue & Traffic". Eurotunnel. 20 January 2004. Retrieved 21 January 2009. ^ a b "Eurotunnel: 2005 Traffic and revenue figures". Eurotunnel. 16 January 2006. Retrieved 21 January 2009. ^ a b "Eurotunnel 2007 Traffic and Revenue figures: a remarkable year". Eurotunnel. 15 January 2008. Retrieved 21 January 2009. ^ a b "Eurotunnel 2009 traffic and revenue figures". Eurotunnel. 10 January 2010. Retrieved 6 February 2011. ^ "Traffic and Revenue 2011" (PDF). Eurotunnel. Retrieved 21 December 2012. ^ "2012 revenue and traffic figures for the Eurotunnel Group" (PDF). Eurotunnel. Retrieved 23 January 2013. ^ "Groupe Eurotunnel SA: traffic and revenue for 2013". Retrieved 2 February 2014. ^ "Eurotunnel Group 2014 Traffic and Revenue". Retrieved 27 January 2015. ^ "Eurotunnel gets backing for freight service". AFX. Agence France Presse. 28 October 2004. ^ Dominic O'Connell (3 September 2006). "Chunnel cash row threatens freight trains". The Times. UK. Retrieved 3 September 2006. ^ "Megaprojects and Risk: An Anatomy of Ambition" (PDF). josephcoates.com. Retrieved 19 July 2009. ^ "Eurotunnel unveils plans for second link". Birmingham Post. 6 January 2000. ^ "The CPS: Channel Tunnel". Crown Prosecution Service. Archived from the original on 20 February 2008. Retrieved 11 March 2008. ^ "Facts and figures Eurotunnel 2000-2004/Forecast 2005: Commentry and a suggestion". Adacte.com. June 2005. Retrieved 21 July 2009. ^ "Eurostar hails 'record-breaking' year as profits jump". The Independent (UK). 5 March 2014. Retrieved 25 August 2015. ^ Fayman, Sonia; Metge, Pierre (September 1995). "The regional impact of the Channel Tunnel: Qualitative and quantitative analysis". European Planning Studies. 3 (3): 333. doi:10.1080/09654319508720310. ^ Button, Kenneth (July 1990). "The Channel Tunnel: The Economic Implications for the South East of England". The Geographical Journal. Blackwell Publishing. 156 (2): 187–199. doi:10.2307/635327. JSTOR 635327. ^ "Eurotunnel revenues boosted by shuttle demand". BBC. UK. 18 January 2011. Retrieved 18 January 2011. ^ Harrison, Michael (10 February 2004). "Eurotunnel calls for government support after record £1.3bn loss". The Independent. UK. Retrieved 21 July 2009. ^ "Eurotunnel has £4bn too much debt". The Telegraph. London. 12 January 2005. Retrieved 21 July 2009. ^ Clark, Andrew (21 February 2006). "Debt-laden Channel tunnel rail link is 'nationalised'". The Guardian. UK. Retrieved 21 July 2009. ^ Wolmar, Christian (10 December 1994). "Fire raises Channel Tunnel fears". The Independent. London. Retrieved 25 December 2009. ^ "Inquiry into the fire on Heavy Goods Vehicle Shuttle 7539 on 18 November 1996" (PDF). Channel Tunnel Safety Authority. May 1997. ISBN 0-11-551931-9. Retrieved 21 July 2009. ^ a b C. J. Kirkland (2002). "The fire in the Channel Tunnel" (PDF). Tunnelling and Underground Space Technology. 17 (2): 129–132. doi:10.1016/S0886-7798(02)00014-7. ^ "Lorry fire closes Channel Tunnel". BBC News. 21 August 2006. Retrieved 21 August 2006. ^ Rail Accident Investigation Branch (October 2007). Fire on HGV shuttle in the Channel Tunnel 21 August 2006 (PDF) (Report). Rail Accident Report. Department for Transport. ^ Robert Wright (12 September 2008). "Channel tunnel fire causes further cancellations". Financial Times. Retrieved 21 July 2009. ^ "Channel Tunnel Fire Evacuation". Sky News. 11 September 2008. Retrieved 9 March 2009. ^ "Eurotunnel fully open to traffic". Eurotunnel.com. Retrieved 14 January 2010. ^ "Fire in the Channel Tunnel". ITV. 29 November 2012. Retrieved 12 April 2013. ^ "Channel Tunnel closed and services hit after lorry fire". BBC. 17 January 2015. Retrieved 17 January 2015. ^ Wolmar, Christian (22 February 1996). "Wrong kind of snow in tunnel..." The Independent. UK. Retrieved 21 December 2009. ^ "Delays after Channel Tunnel fault". BBC News. 3 August 2007. Retrieved 14 January 2010. ^ "Severe Weather Brings Eurostar to a Halt". Sky News. 19 December 2009. Retrieved 19 December 2009. ^ Bird, Steve; Lindsay, Robert (21 December 2009). "Eurostar blames 'fluffy' snow for weekend chaos". The Times. London. Retrieved 21 December 2009. ^ Gray, Melissa (19 December 2009). "Eurostar services cancelled as snow brings havoc". CNN. Retrieved 19 December 2009. ^ Randall, David; Lakhani, Nina (20 December 2009). "Thousands stranded in Eurostar chaos". The Independent. London. Retrieved 20 December 2009. ^ "Passengers trapped on Eurostar trains relive ordeal". BBC News. 20 December 2009. Retrieved 20 December 2009. ^ Cole, Rob (18 December 2009). "'Nightmare' Over For Stranded Passengers". Sky News. Retrieved 19 December 2009. ^ "Passengers home after trapped in Channel Tunnel". The Press Association. 19 December 2009. Retrieved 19 December 2009. ^ "Eurotunnel rescues Eurostar" (PDF). Eurotunnel Press Release. 19 December 2009. Retrieved 23 December 2009. ^ "Eurostar transports 500 vulnerable passengers to France". BBC News. 20 December 2009. Retrieved 14 January 2010. ^ Woodman, Peter (12 February 2010). "Eurostar rapped over Channel Tunnel breakdown – News & Advice, Travel". The Independent. UK. Retrieved 27 April 2010. ^ Garnett, Christopher; Gressier, M. Claude (12 February 2010). "Eurostar Independent Review" (PDF report). 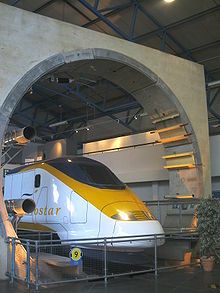 Eurostar. Retrieved 27 January 2010. ^ "Eurostar disrupted after new breakdown in Channel tunnel". The Independent. London. 7 January 2009. Retrieved 7 January 2009. ^ "Stricken Eurostar train towed out of Channel Tunnel". Uk.reuters.com. 7 January 2010. Retrieved 14 January 2010. ^ a b c Pierre Kremer (February 2002). "Sangatte: A place of hope and despair". The Magazine of the International Red Cross and Red Crescent Movement. Retrieved 4 August 2006. ^ Caryl Phillips (17 November 2001). "Strangers in a strange land". The Guardian. UK. Retrieved 4 August 2006. ^ Daniel Silas Adamson; Mamdouh Akbiek (31 March 2015). "I nearly drowned in chocolate". BBC World Service. ^ Avril Stephens (31 July 2007). "Desperate journeys fraught with danger". CNN. Retrieved 4 August 2006. ^ Paul Webster (27 December 2007). "Police braced for new tunnel raid". The Guardian. UK. Retrieved 4 August 2006. ^ "UK/Ireland: Asylum (news digest)". Migration News. May 1998. Archived from the original on 12 January 2013. Retrieved 3 March 2015. ^ "2001 World Press Freedom Review: France". International Press Institute. Archived from the original on 24 October 2007. Retrieved 4 August 2006. ^ "Sangatte asylum talks due". BBC News. 26 September 2002. Retrieved 4 August 2006. ^ "Tunnel security to be tightened". BBC News. 31 May 2002. Retrieved 4 August 2006. ^ Philip Delves Broughton; Andrew Sparrow (27 September 2002). "Blunkett reaches deal to shut Sangatte camp". Daily Telegraph. UK. Retrieved 25 February 2009. ^ "Calais mayor threatens to block port if UK fails to help deal with migrants". The Guardian. AFP. 2 September 2014. Retrieved 3 March 2015. ^ "Cross-Channel transport improving after Calais migrant chaos". BBC News. 24 June 2014. Retrieved 3 July 2015. ^ "Migrant dies on UK-bound freight train near Calais". The Guardian. 7 July 2015. Retrieved 7 July 2015. ^ "Migrant reportedly dies trying to board Channel tunnel freight train". The Guardian. 26 June 2015. Retrieved 7 July 2015. ^ "Britain and France Scramble as Channel Becomes Choke Point in Migration Crisis". The New York Times. 29 July 2015. Retrieved 31 July 2015. ^ "Calais in Frankreich: 2000 Flüchtlinge in einer Nacht am Eurotunnel". spiegel. 29 July 2015. Retrieved 31 July 2015. ^ "Calais: Polizei kesselt Hunderte Flüchtlinge am Eurotunnel ein". spiegel. 31 July 2015. Retrieved 31 July 2015. ^ "Calais: man killed as migrants make 1,500 attempts to enter Eurotunnel site". The Guardian. 29 July 2015. Retrieved 31 July 2015. ^ Bilefsky, Dan (7 August 2015). "Sudanese Migrant Tries to Reach England by Walking Length of Channel Tunnel". The New York Times. Retrieved 7 August 2015. ^ "The Channel Tunnel Safety Authority". 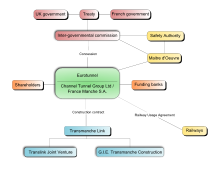 Channel Tunnel Intergovernmental Commission. 2013. Retrieved 11 June 2013. ^ McFarlane, Andrew (12 September 2008). "Focus turns to cause of tunnel blaze". BBC News. Retrieved 12 September 2008. ^ "Formula One: Surtees drives through Channel Tunnel". The Independent. 17 November 2009. Retrieved 2 August 2014. ^ "Chris Froome cycles through the Channel Tunnel". The Daily Telegraph. 7 July 2014. Retrieved 3 March 2015. ^ "Are you sure this is the right way Chris? Tour de France favourite Froome becomes the first person ever to cycle UNDER the sea from England to France in channel tunnel". Daily Mail. 7 July 2014. Retrieved 3 March 2015. ^ Dawinderpal Sahota (9 January 2014). "EE and Vodafone offer Channel Tunnel network coverage". Telecoms.com. Retrieved 11 January 2014. ^ "Eurotunnel completes mobile telephone and internet connections in Channel Tunnel" (PDF). Eurotunnel. 6 May 2014. Retrieved 7 May 2014. ^ "4G From EE Live in the Channel Tunnel". EE. 21 November 2014. Retrieved 21 November 2014. ^ Michael Garwood (21 November 2014). "EE and O2 now providing full 2G, 3G, and 4G access in Eurotunnel". Retrieved 24 November 2014. Bonavia, Michael R (1987). The Channel Tunnel Story. Newton Abbot: David & Charles. ISBN 0-7153-8964-5. Foreign & Commonwealth Office (1994). The Channel Tunnel Story: The world's longest undersea tunnel system. London: Foreign & Commonwealth Office. "Main tunnel dig starts". RAIL. No. 93. EMAP National Publications. 6–19 April 1989. p. 6. ISSN 0953-4563. OCLC 49953699. Moore, Gary; Sutton, Philip (30 November – 13 December 1989). "Eurotunnel competes service tunnel". RAIL. No. 110. EMAP National Publications. p. 7. ISSN 0953-4563. OCLC 49953699. Wikimedia Commons has media related to Eurotunnel. Forbes, Horace Courtenay Gammell (1883). Shall we have a Channel tunnel? . Aberdeen: A. Brown & Co. This page was last edited on 24 September 2018, at 00:10 (UTC).